If you would like to be included in a database of people who will to be notified of significant events in the world of LHON, such as clinical trials for new treatment options, or to be notified as others located near you join the “LHON community,” please complete and submit this form. Receive text messages from LHON Canada? Request a Referral to an Experienced LHON doctor. By clicking “JOIN” you consent to participate in the LHON Canada Contact Registry and authorize use and disclosure of protected health information as detailed below. You also consent to receive correspondence from LHON Canada from time to time. 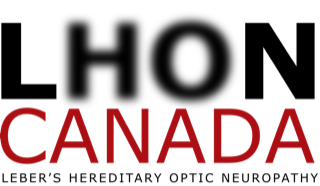 The only risk of joining the LHON Canada Contact Registry is risk to your privacy, similar to that encountered through everyday use of the internet. Read the information before you decide to join. The LHON Canada Contact Registry will only collect information about you (or your family member) such as name, date of birth, address, email address, and LHON type (if applicable). We collect information about your identity and your health to allow us to share information that might help you identify ways to improve your life or diagnosis or treatment options. All information will be used for contact purposes only and all responses will be kept private and confidential. We may use information you provide to assign a unique universal identification number known as a GUID that will allow researchers to share your data with other researchers, without revealing your identity. You may revoke your authorization at any time. If you choose to withdraw your authorization, you will no longer be a participant in the LHON Canada Contact Registry. We will stop collecting new information about you, but will still use the information we have collected about you before you withdrew your authorization. All information collected about you as part of the LHON Canada Contact Registry will be kept confidential to the extent permitted by law or as detailed above. Contact the LHON Canada at LHONContactRegistry@LHONCanada.ca if you have questions about the LHON Canada Contact Registry.